You can choose the odometer, tripmeter A or tripmeter B by pressing the TRIP button for less than 1 second. It is forbidden that alteration of the odometer of any vehicle with the intent to change the mileage registered on the odometer. The alteration may void your warranty coverage. The tripmeter indicates the distance of individual trips selected by the driver. 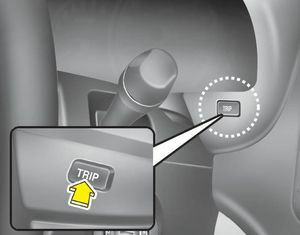 Tripmeter A or B can be reset to 0 by pressing the TRIP button for 1 second or more, and then releasing.